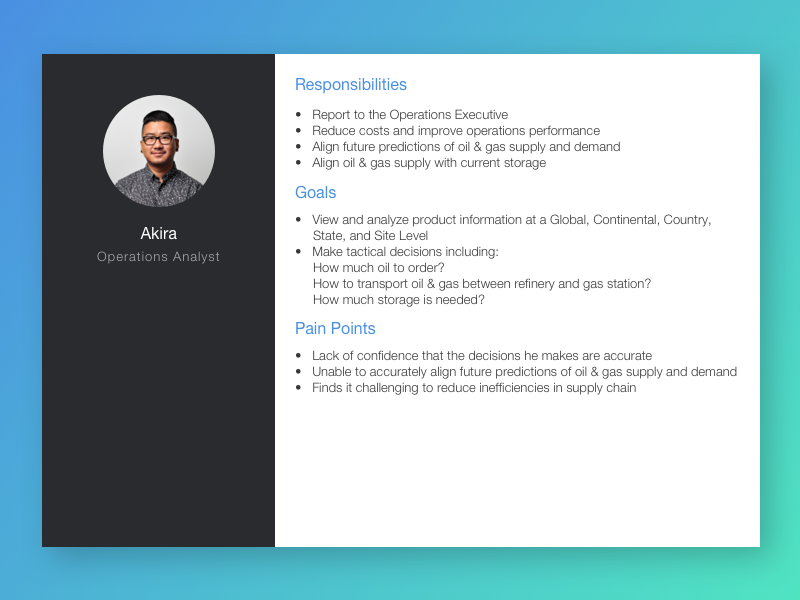 I joined a UX Designer and a UX Researcher, in a 3-week project, to help Deep-r design a customizable dashboard for executives and engineers in Oil & Gas industry, so that they could see all the complex data they need in one central location, which would help them make quick and accurate data driven decisions. We spent three weeks, researching the industry, learning about best practices in designing B2B complex dashboards, and speaking with data scientists and engineers, who could be the potential end users. We then gathered our research findings and used all the info to create a customizable dashboard and a simulation page, which would allow users to explore scenarios and options to improve operational efficiency. The executives at Deep-r were very happy with our work. At the end of our presentation, one of the founders said: “You took our vision and gave us something better!”, which made us feel very happy and accomplished, as we had fulfilled our duty as UX consultants. Based on what we heard during our first meeting with Deep-r executives, we formed a hypothesis that we had to design two completely different dashboards and experiences to feed two different end users that Deep-r team had described. We started with heuristic evaluation of the early stage product screenshots provided by Deep-r team. We then searched for companies that were using machine learning and Artificial Intelligence in Oil & Gas industry. We could not find a direct competitor with similar product to what Deep-r is building. How can we help oil companies make sense of complex data to make better decisions? If we create a customizable and scalable user-friendly dashboard, we can help our end users view all the data they need at once and in one place, which will help them make quick data-driven decisions to increase efficiency of their department and eliminate unnecessary costs. All oil and gas metrics are strongly tied to geography. 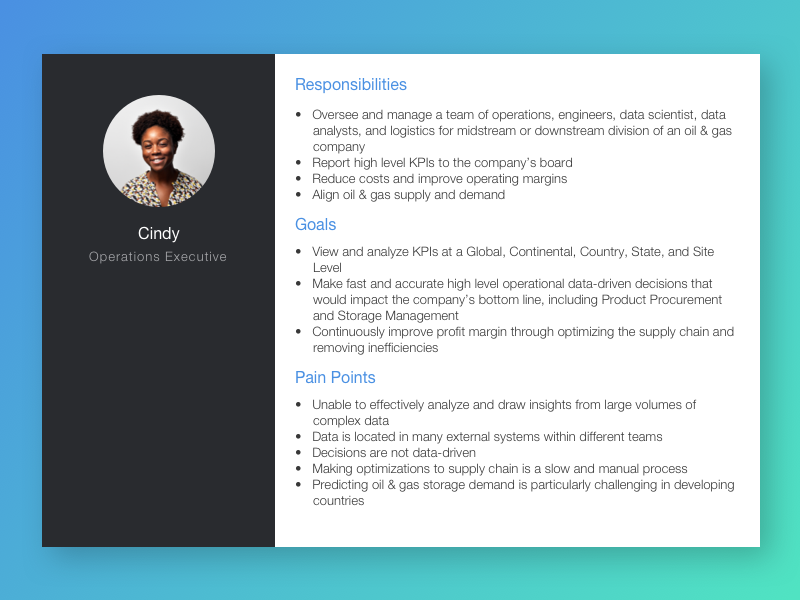 The operational and reporting structure also varies within an oil and gas company. Through our research on best practices for dashboards, we found out that effective dashboards are not read only. Users need to be able to see the most important thing you want them to see and should also be able to act upon it. Alerts and notifications help draw users’ attention to the most pressing matter. Micro animation and confirmations help communicate with users that the tasks they performed were either completed successfully or warn them if they need to redo or change anything. Since different user have different needs and priorities, it is highly recommended that dashboard are customizable, where users could add or remove panels when they need to, in addition to being able to move the panels around and sort them based on their often use. You do not have to show everything on one page. Less frequently used items could be sorted under different menus. The use of clear iconography can help save more space, and you do not try to fill empty space with unnecessary items. We synthesized our findings into two personas, which helped us keep our end users in mind during our design process. We interviewed data scientists and conducted secondary research on dashboard, data visualization, and organizing complex data best practices. The results led us to our concept, mock ups, and scenarios. In spite of all the research we conducted, there were still many unsolved puzzles and confusions when it came to KPI prioritization and the type of data we were supposed to visualize. We were also working with placeholder contents and needed more clarification. Since we did not have any access to our end users or their real data, we asked our client to co-create with us and help us choose from various options we had came up with during our own brainstorming session. In addition to suggest customization as part of functions for dashboard panels, and out of our respect to Minority Report and all the other high tech spy movies, we designed two versions of dashboards with light and dark backgrounds for the users to choose from. Deep-R executives had an amazing vision, which they referred to as “Sandbox”. Aside from the main dashboard, they asked us to design an environment, where the users could explore different scenarios to choose the most cost and time efficient way to deliver different products (different brands of oil & gas) from the refinery to the storage terminal and would see different consequences should they choose to act upon the options that sandbox would suggest. 1) What kind of alerts could we have on our dashboard to help our users take action in a timely manner? 2) What are the actions our users might have to take based on the info that is presented to them? 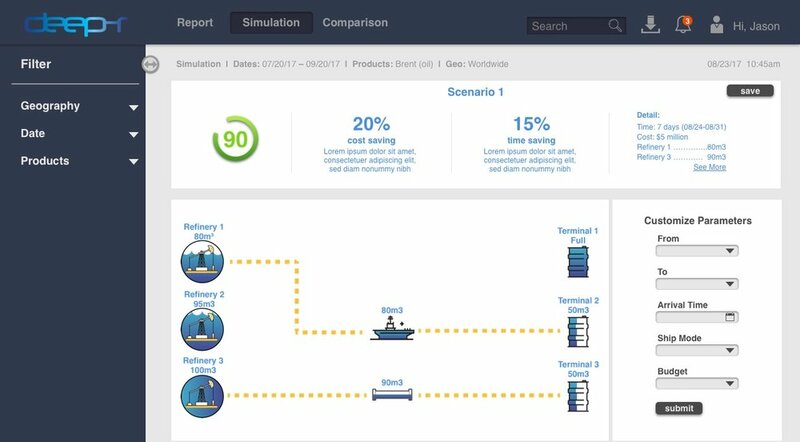 As we explored “the Sandbox” concept, it made more sense for the environment to automatically generate optimized scenarios to help user choose the most cost and time efficient way to deliver product from the refinery to the storage terminal. Deep-R would use machine learning and AI to gather the required data. However, since even the most intelligent devices are not error-free and there might be so many other factors and situations that could affect the decisions that users might make including, but not limited to environmental, political, or local constraints, in addition to automatic optimization, we decided to create a calculator that would give users the ability to add constraints and override automatic scenarios. Each scenario would show the cost, the estimated time, and the consequences that users might face if they choose them. Users have the ability to compare scenarios, save them for future references, and print them to run by executives or board members. We later called Sandbox “Simulation” and separated it from the main dashboard by putting it on its own page. Based on our conversations with potential end users in oil & gas industry, we found out that while B2B dashboards are very complex and not mobile-friendly, users need to often have access to their dashboards on their phones and tablets and when they are on the go in order to take immediate actions on high level alerts. Our client, Deep-R had developed their first version of their dashboard as a scalable responsive web-based dashboard. However, there were still too much information on a mobile view as it would scale down. In our version, we suggested that Deep-r would sort less frequently used items under a hamburger menu, and only show the summary and the panels stacked on top of each other. At the end of the third week, we presented our research findings and our proposed solution to Deep-r team. The executives at Deep-r very happy with our work. At the end of our presentation, one of the founders said: “You took our vision and gave us something better!”, which made us feel very happy and accomplished, as we had fulfilled our duty as UX consultants. Deep-r is going to conduct series of usability testing with their end users in Mexico City and Madrid. They will contact us if they need our help anywhere in the process. We hope to be able to see the dashboard live by the end of the year.